Starting this week! 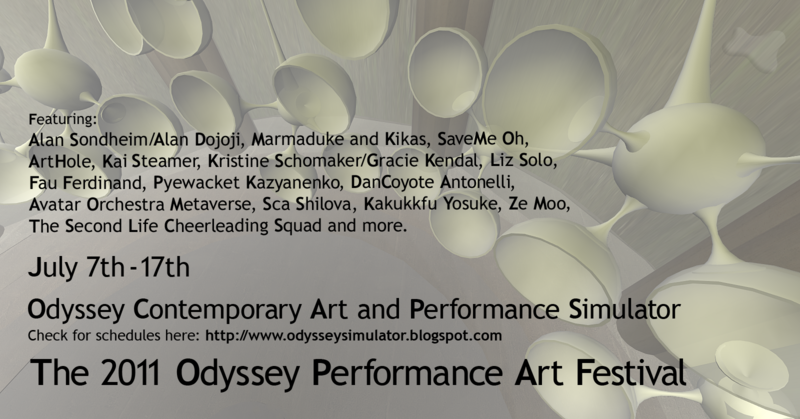 The 2011 Odyssey Performance Art Festival runs from July 7th until the 17th on Odyssey. Featuring performances by: Alan Sondheim/Alan Dojoji, Marmaduke and Kikas, SaveMe Oh, ArthOle, Kakukkfu Yosuke, Kai Steamer, Kristine Schomaker/Gracie Kendall, Liz Solo, Fau Ferdinand, Pyewacket Kazyanenko, DanCoyote Antonelli, the Second Life Cheerleading Squad, Sca Shilova, the Avatar Orchestra Metaverse and more.